October 25, in the street of Adam Mickiewicz in Kyiv, an explosion occurred near a 5-story apartment building, Espresso.TV informed. Reportedly, the unknown people committed an attempt on a people's deputy from the "Radical Party" Igor Mosiychuk. According to reports in social networks, residents of the Karavaevy Dachi district heard the explosion at about 22.00. As a result of the explosion, five people were injured. One of them was Ukrainian People’s Deputy Igor Mosiychuk. The deputy's guard, a 30-year-old special police officer, died from his injuries in the hospital. The attempt on the People's Deputy Igor Mosiychuk is related to his professional activities, according to the head of the faction of the Radical Party of Ukraine Oleh Lyashko. "The guard of Igor Mosiychuk has died." His name was Ruslan. He died in hospital No. 17 from injuries as a result of the explosion. Eternal memory to a man of courage! He had a pregnant wife," he wrote. Igor Mosiychuk himself is in the hospital, he is undergoing a surgery. He has many shrapnel wounds, according to the information, MP from the Radical Party Dmitry Linko provided on Facebook. According to Linko, the assistant to I. Mosiychuk was also seriously wounded. The channel Espreso.tv reports, that during the explosion, political scientist Vitaly Bala, who together with Igor Mosiychuk took part in live discussions was seriously wounded as well. The channel informs, that the explosion damaged the windows in the two houses, and the front doors. Police officers, rescuers, explosives technicians and investigators are working on the site. According to People's Deputy Anton Gerashchenko, the explosion was at least 1 kg in TNT equivalent. Gerashchenko pointed out that according to one version of the investigation, the explosion was the work of Russian special services aiming to destabilize the political situation in Ukraine. The deputy also recalled that "the same fate befell the journalist Pavel Sheremet, GRU officer Maksim Shapoval, Colonel of counterintelligence Yuri Voznoy, Colonel Aleksandr Kharaberyush." 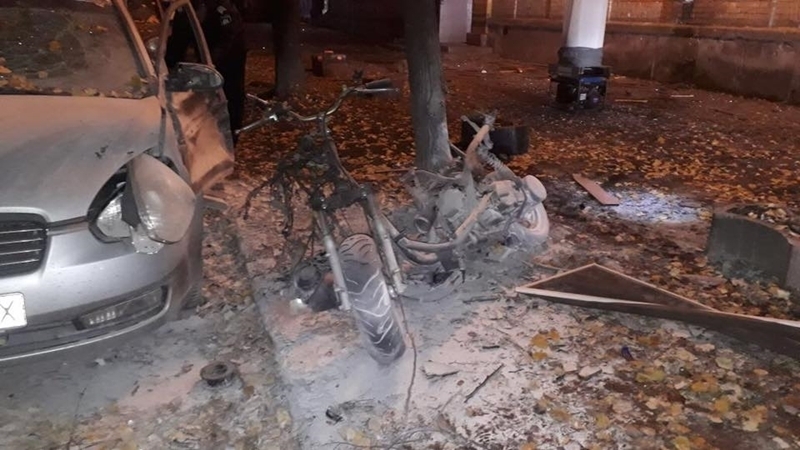 According to preliminary information, the explosives for the attempt on the people's deputy Mosiychuk were laid in a motorcycle, standing near a car. Ukrainskaya Pravda, referring to the capital's prosecutor's office, reports that the explosion, as a result of which the People's Deputy Igor Mosiychuk was injured and his security guard was killed, can be qualified as a terrorist attack and an attempt on the state leader. Law enforcers tend to qualify the explosion at Mickiewicz Street as a terrorist act. In this case, the explosion will be investigated by the Security Service of the Security Service in Kyiv and the capital Prosecutor's Office will exercise procedural control. Article 112 of the Criminal Code of Ukraine (an attempt on the statesman) and part 2 of Article 115 of the Criminal Code of Ukraine (premeditated murder committed in a generally dangerous manner) are being considered. The final qualification will be determined after the conduct of priority investigative actions on the morning of October 26. At the same time, the Ministry of Internal Affairs of Ukraine reported that the explosion in Kyiv is qualified as a terrorist attack. “Criminal proceedings have been opened under Article 258 of the Criminal Code of Ukraine - The terrorist act,” reads the message of the Ministry of Internal Affairs on Facebook.